Scientists are about to measure seismic activity on Mars for the first time. NASA is set to launch the InSight lander as early as May 5, carrying a seismometer to the red planet. The goal: learning how planets are born. Like Earth, Mars and other rocky planets have a crust, mantle and core. And Mars has tectonic plates, too, although fewer than Earth does. Earth is like an egg shell, with its surface broken in many small pieces. Over billions of years, these actively shifting tectonic plates have hidden much of our planet's ancient history. Mars has fewer breaks in its crust, and the planet's surface is breaking at a very slow pace. So Mars, at an earlier phase in its geologic evolution, offers the chance to see an infant version of our home planet. 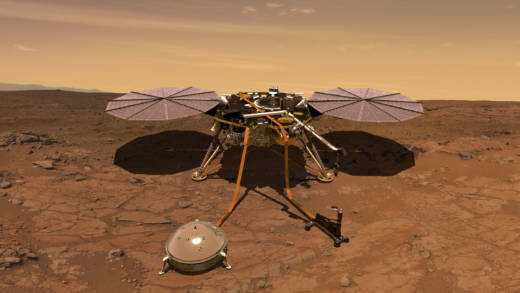 InSight, which stands for Interior Exploration using Seismic Investigations, will spend about six months traveling to Mars. 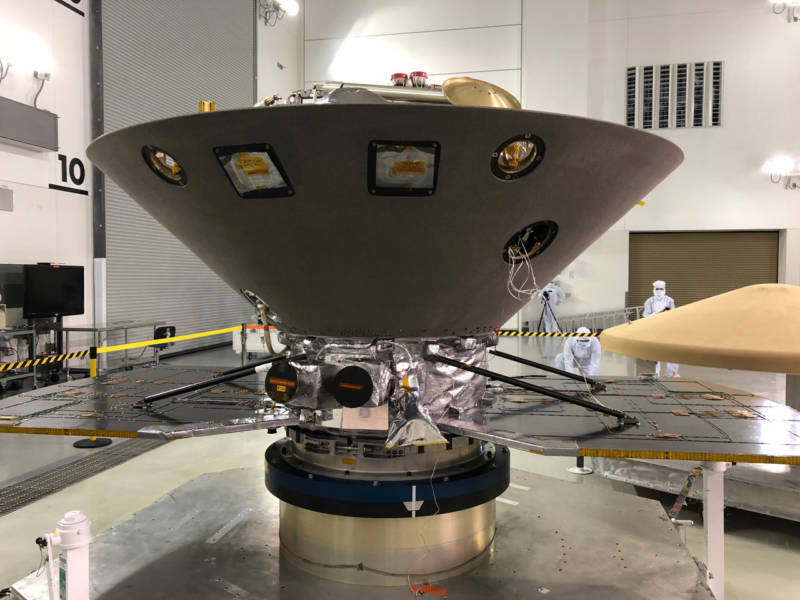 And before InSight heads off on its mission, NASA's Jet Propulsion Laboratory is taking a model of the lander on a roadshow. Bay Area residents can catch InSight at the Exploratorium in San Francisco, April 18-22. Venton: So, we're here at the webcast studio at the Exploratorium and there's going to be a very special visitor here in a few days. Hawkins: That's right, we have the whole team from the Jet Propulsion Laboratory in Pasadena that's coming to share with us all the excitement of the InSight Lander. Venton: So there will be a model of it here. It has some kind of interesting equipment on it. What do you think is especially important? Hawkins: There are three scientific instruments aboard the InSight Lander. The one that I'm most excited about is the seismometer, because it will measure quakes on Mars. Venton: Why do we want to know about earthquakes -- not earthquakes, I guess they're called marsquakes. Why do we want to know about quakes on Mars? I think a lot of people would be surprised to even know that there are quakes that happen in space. Hawkins: Yeah, they're not part of the popular consciousness as evidenced by our stumbling in terms of how we call it, what do we call it. Marsquake, or earthquake, or earthquakes on the moon. I mean it starts to get confusing, but as a matter of fact there are moonquakes, for example, in our own satellite, our own moon. There are also ioquakes in one of the moons of Jupiter and there have been research studies that have shown that there are plate tectonics, or evidence of plate tectonics, which are the drivers of many earthquakes here on Earth. Also, that another moon of Jupiter, called Europa, has evidence for such plate tectonics. And so we expect seismic activities are also taking place there. 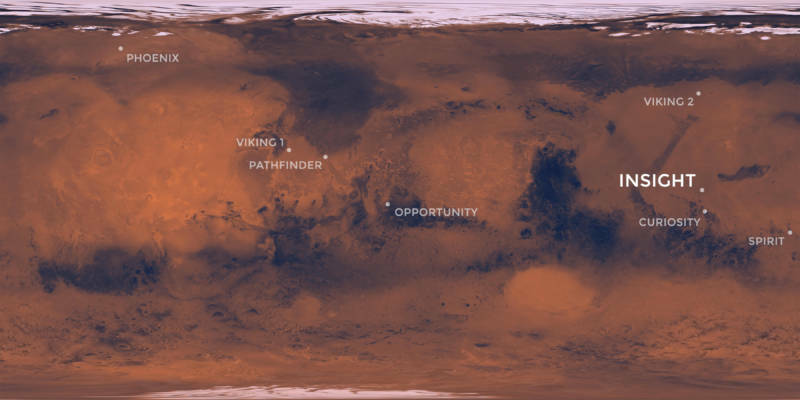 Venton: What will a better understanding of marsquakes help us learn about the planet? Hawkins: Well, by understanding how the planet is quaking, we can get an idea of how the early solar system was formed and what were those early processes. Not just on Mars, but also on the other terrestrial planets, which are the inner rocky planets of the solar system. Venton: Is Earth one of those? Hawkins: Yes, Earth is one of those. Venton: So, will studying quakes on Mars help us understand more about our own planet? Hawkins: Yes, definitely by studying the inner layers of Mars and understanding how Mars formed and evolved geologically, that information can provide insights into the other terrestrial planets or the other inner solar system planets. Earth is much more geologically active than Mars, so Mars retains those early fingerprints as to how those processes began a long time ago. And that information has been lost here on Earth, because the planet is so much more active, but Mars still retained that early fingerprint information that's so necessary. Venton: So is Mars in this way an earlier version of the Earth? Hawkins: Yes, that's a great way of putting it. Venton: That is really cool. Hawkins: Yeah, it's really cool that we can actually travel across the solar system and do investigations that will give us insights as to how we came to be and how we're evolving.